After playing for Smethwick Highfield, was signed by Bristol Rovers in January 1952, where he scored on goal in 8 league appearances. He joined rivals, Bristol City in May 1953 and in two seasons at Ashton Gate added a further 17 goals in 39 league outings. His next move was to Swindon Town in September 1955, where he enjoyed his longest spell with any of the clubs that he played for. Scoring 31 goals in 114 league appearances, Micklewright joined Exeter City in July 1959. 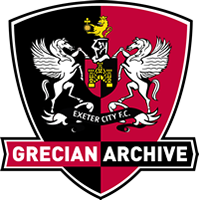 His first game for the Grecians was on the opening day of the 1959-60 season and he scored in a 1-1 draw with Northampton Town at St James’ Park. Despite being a regular in the City first team, he was one of several players released in the summer of 1960 when the club made financial cut backs. Micklewright returned to the Midlands and signed for Nuneaton Borough. On retiring from playing he lived in the Torbay area and was a keen course fisherman and artist. Andy Micklewright died on 5th August 2006. Andy was my grandad. Much loved and missed. I haven't seen this post before.